Eileen and I, two friends from Arlington, Massachusetts, often talked about a plan to spend more hours in our week creating. For Eileen, this meant painting. For me, it was simply baking. One morning I showed up at Eileen’s house with a pie. It was now Eileen’s turn to spend a few hours doing what she enjoys. 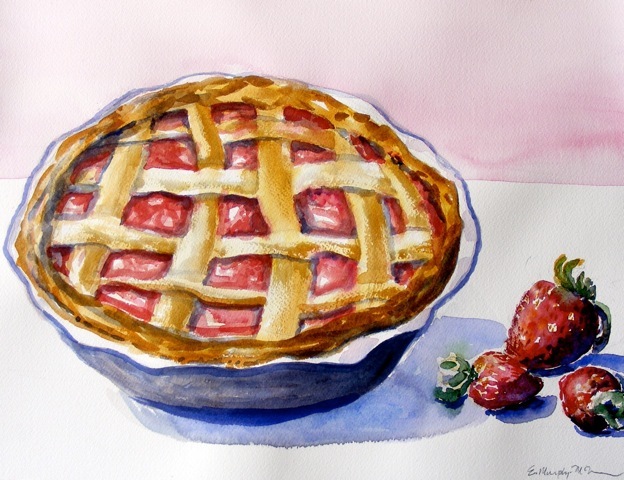 Eileen is the true artist in our “pie project,” but I so enjoy creating her subjects. Thank you to “Syndic” for a deadline. Deadlines light the fire. Heat oven to 350 degrees. In bowl of food processor fitted with steel blade, process cookies with a dozen one-second pulses, then let the machine run until crumbs are fine, about 20 seconds. Put crumbs in a medium bowl, drizzle with cooled butter and combine until crumbs are moist. 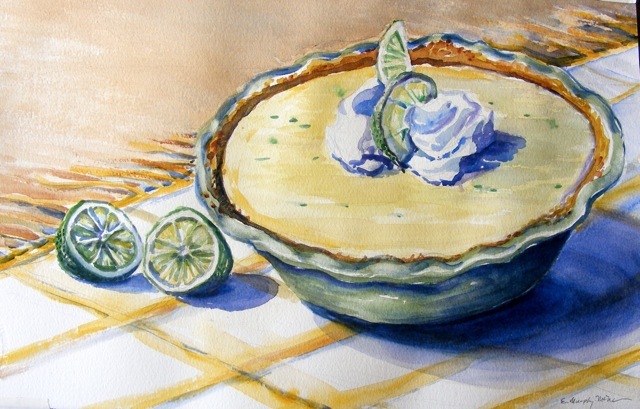 Pour crumbs into a 9-inch glass pie plate, pressing crumbs evenly onto bottom and sides of pie plate. Refrigerate lined pie plate for 20 minutes, to firm crumbs, then bake about 10 minutes. 6 ounces semisweet Ghirardelli chocolate, chopped. Bring half-and-half, salt, and 3 tablespoons sugar to simmer in medium saucepan over medium-high heat, stirring occasionally to dissolve sugar. Stir together cornstarch and remaining sugar in small bowl, then sprinkle over yolks and whisk, until mixture is glossy, sugar begins to dissolve, and mixture slightly thickens, about 1 ½ minutes. When half-and-half reaches full simmer, drizzle abut ½ cup hot half-and half over yolk, whisking vigorously to temper; then transfer egg yolk mixture into simmering half-and-half and keep whisking. The mixture should thicken in about 30 seconds. Simmer about 15 seconds longer, whisking constantly, until a few bubbles burst on the surface and mixture is thickened and glossy. Off heat, whisk in butter until incorporated; add chocolates and whisk until melted, scraping bottom to fully incorporate. Stir in vanilla, then immediately pour filling into crust. Press plastic wrap directly on surface of filling and refrigerate pie for at least 3 hours. Beat cream, sugar, and vanilla in bowl of stand standing mixer on low speed, until small bubbles form (30 seconds). Increase speed to medium, about 30 seconds more, until you notice beaters leaving a trail. Finish beating on high speed until cream is smooth, thick and is forming soft peaks, about 40 seconds. 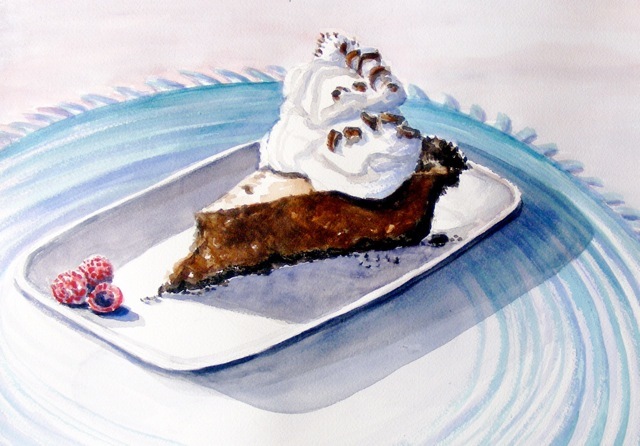 Spread whipped cream over chilled pie and garnish with grated pieces of chocolate. 1/3 cup unsalted butter melted. In bowl of a food processor fitted with a steel blade, process graham cracker and sugar until crumbs are fine. Add melted butter and pulse a few more times, until crumbs are moist. Using hands, press crumbs into the bottom and up the sides of a greased 9-inch pie plate to form a crust. Bake for 8 minutes at 350 degrees and then cool. Combine all the ingredients. Beat with an electric mixer until filling thickens, about 1 minute. Pour filling into the baked crust and bake for another 8 minutes. Chill, then freeze for 1 hour before serving. (If made the night before, it is not necessary to freeze for the one hour. It should slice cleanly.) Serve with huge dollop of fresh whipped cream. Line a 9-inch pie plate with half of the pastry. Mix the remaining ingredients and turn into the prepared pie plate. Cut the remaining pastry into strips and make a lattice top for the pie. Trim dough and flute the edges. Bake for 15 minutes then reduce heat to 350 degrees and bake for 30 minutes longer, until the rhubarb is tender and the crust is brown.